Michel de Nostredame, aka Nostradamus, wrote his first set of predictions in the form of quatrains in 1555, yet books of his writings are still popular today. There’s a reason for their popularity: interpreters have shown that it’s possible to match Nostradamus’s predictions with key historical figures and events. The Nostradamus predictions for 2019 are dire, including economic collapse, what might become World War 3 (WW3), and the end of taxes. The Nostradamus WW3 predictions have gained traction because so many people feel helpless. They sense that the world is beyond their control and they feel that difficult times are ahead. Visionaries like Nostradamus have foreseen cataclysms and turbulent times. Nostradamus also confirms centuries-old expectations of a final battle between good and evil. The period we are living in has certainly given us many signs of this upcoming battle. 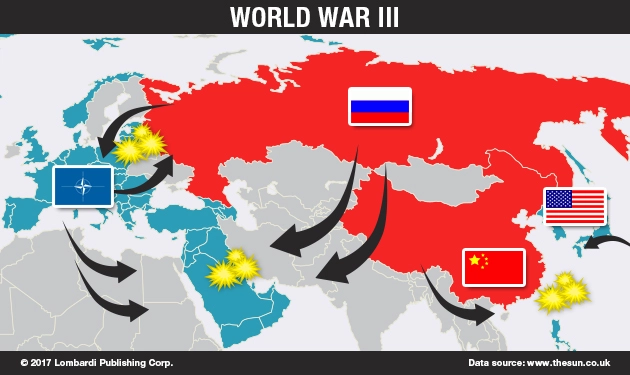 The Nostradamus WW3 predictions fit nicely within this framework. Nostradamus didn’t start to compile his visions until later in life in the middle of the 16th century, but he had started to experience visions at a very early age. According to reports, he would look into a bowl full of water and receive visions of the future. Nostradamus has been credited with predicting events as diverse as the 1871 Great Fire of Chicago, the rise of Adolf Hitler in the 1930s, and the rise of President Donald Trump in 2016. Possibly for 2019, he has predicted the start of a cataclysmic war. The source of Nostradamus’s visions and his ability to predict the future with accuracy remain mysterious and should be taken with a few helpings of salt. In particular, a Nostradamus predictions list for 2019 should take into consideration events before and after. A better way to consider Nostradamus is to look at the next four or five years. That said, beyond the individual Nostradamus future predictions for 2019, there is a common theme. It’s that negative energy will intensify and accelerate with unprecedented intensity and speed. One of the signs is that society has become ever more inequitable, fueling negative energy. This intensification of spiritual evil could provoke the destabilization of the world. According to Nostradamus’s vision for 2019, the culmination will be a series of natural disasters and a third world war. While the natural phenomena might be hard to confirm, we have already seen credible threats of war. Since the Cold War effectively ended in 1991, the world has forgotten the fear that the possibility of World War 3 used to generate. That said, World War 3 news has become current again. That’s because certain countries have resumed a level of tension not seen since about 30 years ago. And instead of diffusing the tension, senators and congressional representatives in Washington have been fueling it. 1. Great eruption of Mount Vesuvius: Nostradamus has predicted a great volcanic eruption. The volcano in question is Mount Vesuvius in Italy, and Nostradamus has forecast that it will “shake the earth every five minutes,” killing at least 6,000 people. 4. World War 3: This is the big one. Frankly, Nostradamus might have gotten this one spot-on if the U.S., Russia, and other countries don’t stop their warmongering. Anger to the vanquished, and victory in a drizzle. Nostradamus’s quatrains describe a level of destruction more gruesome than anything he had predicted earlier. It also fits with the suggestions of an “Antichrist” arising and of Trump fighting people who come from the east—ISIS, for example—in the Mediterranean. 6. End of taxes in the West: Nostradamus may have another point here. President Trump has already cut taxes for Americans. Meanwhile, many of the populist parties rising in Europe have advocated lowering taxes as a prescription to increase economic growth. Nostradamus predicted that a mass revolt will end the practice of taxation once and for all. Before you write a letter to the Internal Revenue Service (IRS) advising the agency of its imminent demise, remember that Nostradamus specified that it will happen only after a massive revolt. Nostradamus wrote that people “will simply refuse to pay the King any more taxes” and that people will celebrate in a country where they have been “taxing without mercy.” That could stand in for any developed country today. It may even suggest a massive tax revolt in the West in general. Nostradamus also suggests that the tax revolt might be part of an overall revolt against monarchies in countries that still have such institutions. That could include the United Kingdom, Spain, Norway, Sweden, or Denmark—where taxes are indeed very high. 7. Humans will live to be over 200: “The advancements of medicine will raise humans’ life expectancy up to at least 200 years of age,” wrote Nostradamus. This prediction has been gradually materializing. Life expectancy in developed countries has increased to an average of more than 80 years. Furthermore, Nostradamus predicted, “An 80-year-old man will look just like a 50-year old.” These days, plastic surgery has made it possible (for those who can afford it) to look decades younger than their calendar age. It’s logical to expect such trends to evolve. 8. Right to parenthood: “Those who want to have children will require a license or a permit. They won’t be able to act as they please,” wrote Nostradamus. This prediction makes sense in the context of the fears that many rational economists already entertain. China had already experimented with this policy, officially limiting families to no more than one child. 9. Language differences will disappear: Nostradamus wrote that because of a new motor, the world will return to being as it was during the days of the Tower of Babel. Students of Nostradamus believe that the new “language motor” will be used as we use computers today. Nostradamus says this is one of the signs that many of the world’s nations will cease to exist. 10. Humans will speak to animals: Nostradamus predicted that pigs will befriend humans. Some suggest that this was a prediction of scientific advancement, in that genetic mutations will enable humans to communicate verbally with their animal companions. Consider these predictions with caution, but many of these warnings—with a few amendments— could certainly apply to the current world. Even for the skeptics, among whom I include myself, there are some ominous-sounding Nostradamus predictions to generate concern. Remember, Nostradamus was writing this in the mid-1500s. Yet there he was, describing an event eerily like what happened in his country in 1789, over 200 years later: the French Revolution. That’s when the French people had enough of their aristocratic rulers and revolted. The peasants (the “slavish mob” cited above) took control of Paris and forced their demands on the royals and the nobility. The aristocrats (princes and king) were removed from power and locked up in the Bastille (“prison”) and beheaded by the guillotine (“headless idiots”).